Virtually all business properties are subject to vandalism. Vandals can strike anywhere: in cities, suburbs, and rural areas. Fortunately, there are steps businesses can take to discourage vandals from targeting their property. While the definition of vandalism varies from state to state, the term generally means the intentional damage, destruction or defacement of someone's property without the owner's permission. Vandalism is a criminal act and is prohibited by state laws. It may qualify as a misdemeanor or a felony, depending on the amount of financial damage that's involved. Some states refer to vandalism as criminal mischief or malicious mischief. 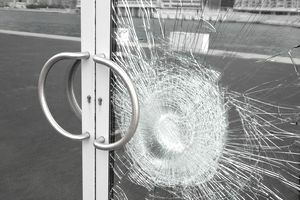 Vandals may target buildings, personal property or both. According to the Urban Institute, vandals typically strike in the late evening when business property is unattended. Juvenile offenders may commit acts in the afternoon after school has let out. Vandals often target public or semi-public property like buses, train stations, and street signs. Such property is easy to access and is often poorly protected. Vandals may also hit private property that's in close proximity to public areas. Vandalism can impact your business in a number of ways. First, it can damage your property. Damaged or defaced property requires time, effort, and money to repair. Secondly, vandalism may cause your business to lose income if the vandalized property cannot be used and is essential to your operations. Thirdly, graffiti, trash, and other types of defacement can have a negative effect on your company's image. Such damage can deter potential customers from entering your premises. Fourthly, vandalism can lower the value of your property. Property that has been damaged or defaced may be unattractive to potential buyers or tenants. Finally, some types of vandalism, such as broken windows, can cause bodily injury to employees or visitors. While you cannot prevent all acts of vandalism, you can discourage vandals from striking your property by taking the steps outlined below. Additional suggestions for thwarting vandals are available from the Urban Institute's website. Keep property tidy. Keep your premises clean, tidy, and free of trash. Disorder attracts vandals. Maintain good lighting. Make sure your property is well-lit at night. Check light bulbs regularly. Install cameras. Install video cameras to monitor activity on your premises. When crimes have occurred, police can use your recorded video to catch the perpetrators. Consider shrubbery or fencing. Fencing or shrubbery can discourage vandals from entering your property. Shrubs that have prickly or scratchy leaves like holly and pyracantha can help keep intruders away. Consider break-resistant glass. Glass that is break-resistant or coated with security film is stronger than regular glass and difficult for vandals to penetrate. Don't ignore it! Vandalism tends to beget more vandalism and can encourage other types of property crimes. Thus, you should make repairs and remove graffiti promptly. Your quick response shows that you care about your property and won't tolerate its defacement. Contact authorities. The police department can't respond to crimes it isn't aware of. Report all vandalism to your local police department. The department may increase patrols in your area or create a hotline for reporting incidents. Share information. Ask other business owners in your area if they have experienced acts of vandalism and share the information you collect with other businesses. The information may reveal patterns. For example, vandals may be striking at certain times of the day or on certain days of the week. Join a business watch group. Business watch groups are similar to neighborhood watch groups. Group members work to reduce crime by keeping an eye on each other's property. If no watch group exists in your area, you can start one yourself. Tips on how to do this are available from the National Neighborhood Watch website. Most commercial property policies purchased by small business owners cover "all risks," meaning they cover damage caused by any peril that's not specifically excluded. These policies rarely exclude vandalism, so this peril is covered. Most named perils policies also cover vandalism. Most all-risk policies don't define the term vandalism. This word is defined in many named perils forms. In the ISO named perils forms, vandalism means willful and malicious damage to, or destruction of, the described property. Two perils that may occur in conjunction with vandalism are riot and civil commotion. These perils are normally covered under both named perils and all-risk property forms. When people commit violent acts during a civil disturbance, they often target business-owned property. Property that has been vandalized by rioters may be subject to looting. Looting is normally covered in conjunction with riot and civil commotion. Vacant buildings are highly prone to vandalism. Consequently, many property policies contain a vacancy provision like the one found in the ISO property policy. It eliminates coverage for losses caused by vandalism (and several other perils) if the building has been vacant for more than 60 consecutive days. The meaning of vacant varies depending on whether the insured is a tenant or a landlord. If the insured is a tenant, the unit or suite rented by the policyholder is considered vacant if it doesn't contain enough business personal property for the insured to conduct its ordinary operations. If the insured is the building owner, the building is vacant if less than 31 percent of it is being used by the owner or a tenant to conduct its customary operations. The vacancy provision appears in the policy conditions. If a building you own or rent will be vacant for more than 60 days, ask your insurer for an endorsement called a Vacancy Permit. This endorsement suspends the vacancy clause for a period of time. It may be available only if you verify that the building is adequately protected from vandals, freezing, and other perils. What’s Covered by Entertainment Insurance?